The features of the Soviet triangle are that there are three lines, all running roughly straight through city center, meeting at three distinct points forming a little downtown triangle, with no further meets between lines. This layout allows for interchanges between any pair of lines, without clogging one central transfer point, unlike on systems with three lines meeting at one central station (such as the Stockholm Metro). The name Soviet comes from the fact that this form of network is common in Soviet and Soviet-influenced metro systems. Ironically, it is absent from the prototype of Soviet metro design, the Moscow Metro: the first three lines of the Moscow Metro all meet at one point (in addition to a transfer point one station away on Lines 1 and 3). But the first three lines of the Saint Petersburg Metro meet in a triangle, as do the first three lines of the Kiev Metro. The Prague Metro is a perfect Soviet triangle; Lines 2-4 in Budapest, designed in the communist era (Line 1 opened in 1896), meet in a triangle. 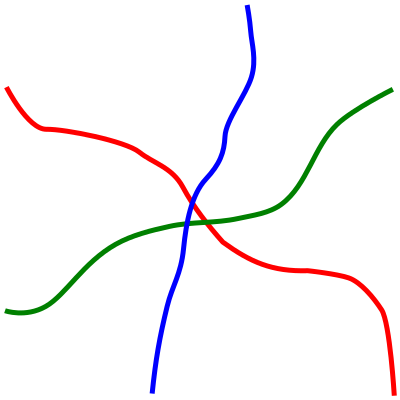 The first three lines of the Shanghai Metro have the typology of a triangle, but the Line 2/3 interchange is well to the west of the center, and then Line 4 opened as a circle line sharing half its route with Line 3. Examples outside the former communist bloc are rarer, but include the first three lines in Mexico City, and Lines 1-3 in Tehran (which were not the first three to open – Line 4 opened before Line 3). In many places subway lines meet an even number of times, rather than forming perfect diameters; this is especially bad in Spain and Japan, where subway lines have a tendency to miss connections, or to meet an even number of times, going for example northwest-center-southwest and northeast-center-southeast rather than simply crossing as northwest-southeast and northeast-southwest. But this post is not purely about the Soviet triangle. It’s about how it fits into a specific scale of transit. Pure examples have to be big enough to have three subway lines, but they can’t be big enough to have many more. Moscow and Saint Petersburg have more radial lines (and Moscow’s Line 5 is a circle), but they have many missed connections, due to poor decisions about stop spacing. Mexico City is the largest subway network in the world in which every two intersecting lines have a transfer station, but most of its lines are not radial, instead connecting chords around city center. Larger metro networks without missed connections are possible, but only with many three- and four-way transfers that create crowding in corridors between platforms; in Moscow, this crowding at the connection between the first three lines led to the construction of the Line 5 circle. In many cases, it’s also just difficult to find a good high-demand corridor that intersects older subway lines coherently and is easy to construct under so much older infrastructure. The result is that the Soviet triangle is difficult to scale up from the size class of Prague or Budapest (not coincidentally, two of the world’s top cities in rail ridership per capita). It just gets too cumbersome for the largest cities; Paris has a mixture of radial and grid lines, and the Metro still undersupplies circumferential transportation to the point that a circumferential tramway that averages 18 km/h has the same ridership per km as the New York City Subway. It’s also difficult to scale down, by adapting it to bus networks. I don’t know of any bus networks that look like this: a handful of radial lines meeting in the core, almost never at the same station, possibly with a circular line providing crosstown service. It doesn’t work like this, because a small-city bus network isn’t the same as a medium-size city subway network except polluting and on the surface. It’s scaled for minimal ridership, a last-resort mode of transportation for the poorest few percent of workers. The frequency is a fraction of the minimum required to get even semi-reasonable ridership. Instead, such networks work better when they meet at one city center station, often with timed transfers every half hour or hour. A crosstown line in this situation is useless – it cannot be timed to meet more than one radial, and untimed transfers on buses that come every half hour might as well not even exist. A source who works in planning in Springfield, Massachusetts, a metro area of 600,000, explained to me how the Pioneer Valley Transit Authority (PVTA) bus system works, and nearly all routes are radial around Downtown Springfield or else connect to the universities in the area. There are two circumferential routes within Springfield, both with horrifically little ridership. Providence, too, has little to no circumferential bus service – almost every RIPTA bus goes through Kennedy Plaza, except some outlying routes that stay within a particular suburb or secondary city. The principle here is that the value of an untimed transfer depends on the frequency of service and to some extent on the quality of station facilities (e.g. shelter). Trains in Prague come every 2-3 minutes at rush hour and every 4-10 minutes off-peak. When the frequency is as low as every 15 minutes, transferring is already questionable; at the typical frequency of buses in a city with a bus-based transportation network, passengers are extremely unlikely to do it. This raises the question, what about denser bus networks? A city with enough budget for 16 buses running at once is probably going to run 8 radii (four diameters) every half hour, with a city-center timed transfer, and service coverage extending about 24 minutes out of the center in each direction. But what happens if there’s enough budget for 60 buses? What if there’s enough budget for 200 (about comparable to RIPTA)? I know of one small city that still has radial buses and a circular line: Växjö. The frequency on the main routes is a bus every 10-15 minutes. But even there, the circular line (bus lines 2 and 6) is a Yamanote-style circle and not a proper circumferential; all of the buses meet in the center of the city. And this is in a geography with a hard limit to the built-up area, about 5-6 km from the center, which reduces the need to run many routes in many different directions over longer distances (the ends of the routes are 15-20 minutes from the center). There’s also a separate issue, different from scale but intimately bundled with it: mode share. A city with three metro lines is capable of having high transit mode share, and this means that development will follow the lines if it is given the opportunity to. As the three lines intersect in the center, the place for commercial development is then the center. In the communist states that perfected the Soviet triangle, buildings were built where the state wanted them to be built, but the state hardly tried to centralize development. In Stockholm, where the subway would be a triangle but for the three lines meeting at one station, the lack of downtown skyscrapers has led to the creation of Kista, but despite Kista the region remains monocentric. There is no chance of this happening in a bus city, let alone a bus city with just a handful of radial lines. In a first-world city where public transit consists of buses, the actual main form of transportation is the car. In Stockholm, academics are carless and shop at urban supermarkets; in Växjö, they own cars and shop at big box stores. And that’s Sweden. In the US, the extent of suburbanization and auto-centricity is legendary. Providence has some inner neighborhoods built at pedestrian scale, but even there, car ownership is high, and retail that isn’t interfacing with students (for example, supermarkets) tends to be strip mall-style. With development happening at automobile scale in smaller cities with smaller transit networks, the center is likely to be weaker. Providence has more downtown skyscrapers than Stockholm, but it is still more polycentric, with much more suburban job sprawl. Stockholm’s development limits in the center lead to a smearing of commercial development to the surrounding neighborhoods (Spotify is headquartered two stops on the Green Line north of T-Centralen, just south of Odengatan). In Providence, there are no relevant development limits; the tallest building in the city is empty, and commercial development moves not to College Hill, but to Warwick. With a weaker center, buses can’t just serve city center, unless the operating budget is so small there is no money for anything else. This is what forces a bus network that has money for enough buses to run something that looks like a transit network but not enough to add rail to have a complex everywhere-to-everywhere meshes – grids if possible, kludges using available arterial streets otherwise. This is why bus and rail networks look so profoundly different. Bus grids are common; subway grids don’t exist, except if you squint your eyes in Beijing and Mexico City (and even there, it’s much easier to tell where the CBD is than by looking at the bus map of Chicago or Toronto). But by the same token, the Soviet triangle and near-triangle networks, with a number of important examples among subway network, does not exist on bus networks. The triangle works for cities of a particular size and transit usage intensity, and only in rapid transit, not in surface transit. Long live the 5-year plan! I would go further and define grid patterns for networks based on triangles and squares, apart from the polar grids with diameter/radial and tangential/circumferential routes. A square grid would try to create routes that repeat rectangles. Of course a new world city with blocks and a planed street grid it will be easier to implement a square grid network. The West End of London (around Oxford Circus) has a roughly triangular grid (imagine covering a surface with equilateral triangle tiles). Moscow within the loop is somewhat similar. In practice, the Phoenix metro area is set up well for 3 radial lines. The current light rail system travels north and east from downtown, and the next two branches will go south and west, providing two complete radial lines. Hills and Indian reservations to the north-east and south-west limit development in those directions, so the main suburbs are to the southeast and northwest. And there happens to be a freight rail line heading straight northwest from downtown Phoenix along Grand Avenue. To the east, there is also a freight line heading southeast through the suburbs. The northwest suburbs currently support studying “commuter rail” along the Grand Ave corridor. If it were built as electrified regional rail with EMUs and stops at the 1 mile grid streets, it could be quite competitive with car travel: for example, the 22km trip from Peoria to dowtown Phoenix takes 25 minutes to 45 minutes by car, and would only take 20 to 24 minutes by EMU with 10 intermediate stations at the 1 mile grid, plus a couple downtown. The Munich U-Bahn is an interesting case of a downtown triangle, where each line has 2 suburban branches. And the branches bend enough that they cross each other several times, leading to additional transfers. Boston more or less has this with the Orange, Green, and Red lines meeting at Downtown Crossing, Haymarket, and Park Street. Plus the Blue line which runs only northeast and doesn’t meet the Red Line. can’t believe you left out DC–a famous triangle! There are a lot of triangles with extra crossings: Seoul Lines 1, 3, 4; DC; Tehran Metro Lines 1, 2, 4; many triplets of Vienna U-Bahn lines. hah i forgot DC has an extra crossing! Two extra crossings! The Red Line is U-shaped. Broadway cuts across it diagonally. Union Square at 4th Ave, Madison Square at 5th Ave, Herald Square at 6th Ave. Times Square at 7th Ave. and Columbus Circle at 8th Ave. … an enormous triangle, Leave Jamaica on the E train, change to the M train at Queens Plaza, change to the J train at Delancy/Essex to get back to Jamaica. Or E train to 53rd and Lex, change to the 6 to get to get to Canal Street and change to the J. Or change to the R train at Queens Plaza. Odd loop: Northbound E train from W4th Street, change at 53rd and 7th to a southbound B or D train to get back to W4th. Queensboro Plaza on the 7 to Times Square, change to the N or the W to get back to Queensboro Plaza. I’m not in the mood, there are probably many odd loops that involve Coney Island. In Santiago Chile, pre-Transantiago, the bus network was private and responded to market factors in ways that public transit agencies do not. It represented an interested study in organic design of bus networks. There was substantially more routes that did a 4 or 5 neighborhood stops and then ran direct to a destination using the fastest available route. Given the number & frequency of buses, those destination had sub-10 min transfers to points all over the city. Applied in the US, in a cities the size of Providence, Milwaukee, etc. it seems a fleet of ~40 buses could provide 4-8/hr service from the CBD to 10 neighborhoods, with a downtown timed transfer.